We’re back and so excited to welcome you to the 22nd episode of the DFB Podcast! We’ve been MIA for awhile, but we are so excited to be back in action! You’ll have to listen to this edition to hear about our whereabouts, but we are actively working on new ways to make sure we can record more podcast more often. In this episode we apologize a bunch for being away and cover the recent announcements of Skipper Canteen, Star Wars Land(s), and some updates for Food and Wine 2015! Yay, you guys!!! ??? I just got back from WDW and so needed this surprise new blog. Thank you so much ? One podcast a year and all you can muster is 24 minutes?….maybe you all should just let go of this endeavor. Good show! I hope you are back for good! Glad to see your back! I understand how life gets in the way of even the best intentions. I’m still working on my 10 year olds baby book. 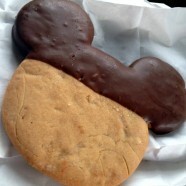 Looking forward to more Disney food talk!